Can two men heal the wounds Ethan's ex left behind?After a decade of a sexless marriage with a philandering alpha who can't even be bothered to show for the daughter's birthday, Ethan St. John finds himself starting over at his childhood home. Exceptldhood home. Except this time, he's a older, wiser, and with a child of his own to raise. Persistently single and awkward, Ryan Davis is swiftly approaching his fortieth birthday with no sign of the singleness abating, but he somehow manages to get Ethan to agree to a date with him. Pub owner Larry Simmons grew up with a sorry excuse for a family, but he’s built his own. It isn’t enough, though. He wants it all: house, partner, kids. 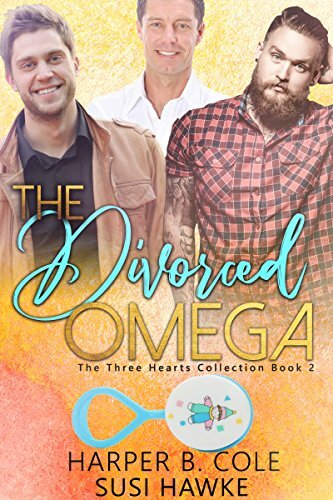 Ethan has no interest in a relationship, but after years of spousal neglect, being the center of two devoted alphas’ attention is intoxicating. Ryan isn’t quite sure how to navigate this new dynamic, but he’s found a space with these two men where he can truly be himself. And Larry? Larry is just waiting for his guys to wise up and see what is right in front of them. This book is 68k of sweet heat as only Harper B. Cole and Susi Hawke can bring, but don't worry, it's not too... knotty. If two are better than one... then three is best!Alpha couple Richard and Dusty may not fit the world's sense of normal, but they have each other. As a graphic designer who works from home while his pilot husband is off flying the friendly skies, Dusfriendly skies, Dusty spends way too many hours alone. Hours spent longing for a family, the family that the orphaned alpha is sadly lacking. Rich never wanted children, but after a decade with his husband, the alpha is ready to open his heart to a child. Even if children are sticky, dirty, and downright irritating, for the most part. Certainly his own child will be above all that. After all, isn't it all just a matter of proper parenting? Josiah isn’t in the market for an alpha. He just needs to stay in forward motion and keep his eye on the prize as he juggles two jobs to raise his little sister who became his charge when their parents died. She's smart. Wicked smart. But her school is convinced she's too challenged, that she'll never be able to finish regular high school, let alone college, refusing to recognize she is brilliant though severely dyslexic. To get her the help she needs, Josiah needs money, and a lot of it.